(MANSFIELD, TEXAS) – Firefield AR Cleaning Kits (FF38000) come with all the products needed to keep your AR in top-notch shape, leaving you with no excuse for a dirty firearm. 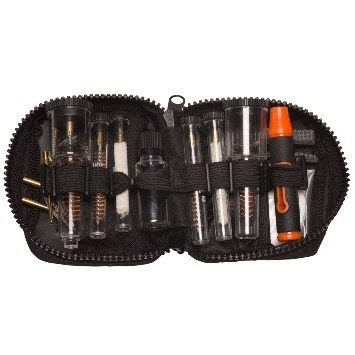 These multi-AR caliber cleaning kits are ideal for rifles chambered in .223 and .308. Accessories include a chamber cleaning brush with rods and handle for a complete deep clean of the star chamber and a 33” cable with bore cleaning brushes for easy and simple bore cleaning. An included lubrication applicator allows you to keep your favorite gun lube stored in your kit for on-the-go cleaning. The AR Cleaning Kit also provides an extra brush for cleaning additional fiream surfaces. Able to be stored easily in a rifle or range bag, a carrying case provides easy storage for all of the cleaning components. This entry was posted in Cleaning Systems and tagged AR Cleaning Kits, FF38000, Firefield. Bookmark the permalink.